Big thanks to Swissmiss for making what I keep calling as my kind of design conference. It brought me back from my self-imposed banishment and disenchantment with design conferences. Held on a monthly basis in cities all over, CreativeMornings brings to light the highly diverse range of makers, who cultivate their disciplines in their respective locations. These local events marry a playful sense of imagination with a grounding quality of place. CreativeMornings celebrates the welcoming nudge and therapy of creativity. Download the free 8-page print-optimized PDF, with links. Big thanks: to organizer Mig Reyes, videographer Erick De La Rosa, photographer Chris Gallevo, including past volunteers, for their great work on making CreativeMornings happen in Chicago. Swissmiss launched a CreativeMornings Kickstarter campaign “to create a growing archive of stories, ideas and advice from remarkable creative minds [currently] across 34 cities.” It reached its goal in a stunning four hours. There are still more days available to help further fund this exciting effort. 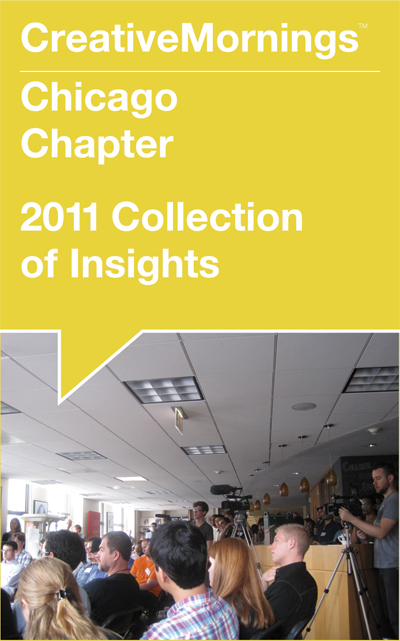 See my ongoing write-ups and photos of the Chicago chapter of the CreativeMornings community. If you liked this lovingly-made publication for downloading, show your appreciation by helping to support my labor of love—Design Feast, which proudly includes this blog. Learn more.